I am Lyndsey, I am a beautician from Belfast battling living with chronic conditions. I want to share my love for beauty with you all and also let you guys in to what it is like to live with debilitating conditions. I hope you are all well. I wanted to share with you my experience on Everythingfivepounds.com. 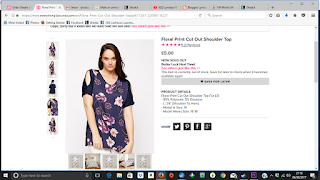 I am in serious need of some new clothes for spring and summer, but as I am trying to lose weight I don't want to spend a fortune on clothes as I am hoping they wont fit me in a few months. 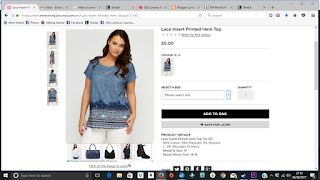 So I am looking for great websites that sell reasonably priced clothes that arent rubbish quality. I have seen many people talking about this website and thought I would give it ago. With regards to the website I do like that you can log in with your social media account so you dont have to remember another login for another website. My memory is shocking so it helps the less I have to remember. 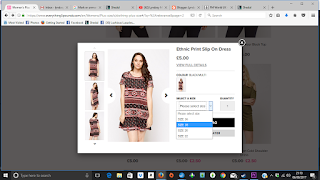 The website is easy enough to navigate, you can shop through different sections, filter sizes and products so that it only shows the size you require. That makes life much easier because you see so many different items that maybe have only one size left. I have now shopped twice on the website. The first time I bought stuff I went for a dress, two tops and a pair of heels that to be honest I bought out of curiosity more than anything. 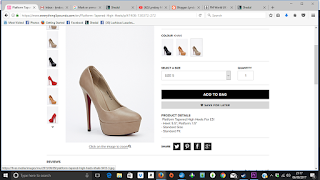 It was a pair of stilleto heels that were only £2.50 in their sale. The parcel arrived about a week after ordering. Not super fast but it did claim 2nd class. These jeans were not a good fit. They sagged at the crotch and bum area. They were not flattering. They were a 14-16 which should have been a good fit for me, but definitely not. The embellishments were tacky and too gawdy in real life. These shoes were surprisingly a lot nicer looking than I first thought they would be. There was a flaw in the sole, it didn't stretch the length of the heel and also wasn't fully attached. The worst part was the fact that I couldn't squeeze my foot in to it!!! They were definitely not the right size that they claim to be!! This top fitted great, there was a few flaws, the holes didn't reach the shoulders but it still looked good. I have actually worn it quite a few times. It may be a little mumsy but hey I am 34 now so I gotta grow up sometime lol. This top I wasn't sure about the pattern but thought if I wasn't happy with it my mum would like it. I couldn't believe it when I put it on and soon realised I was wearing a tent! It was huge on me. I normally wear an 18. This was an 18-20 but it was so big. 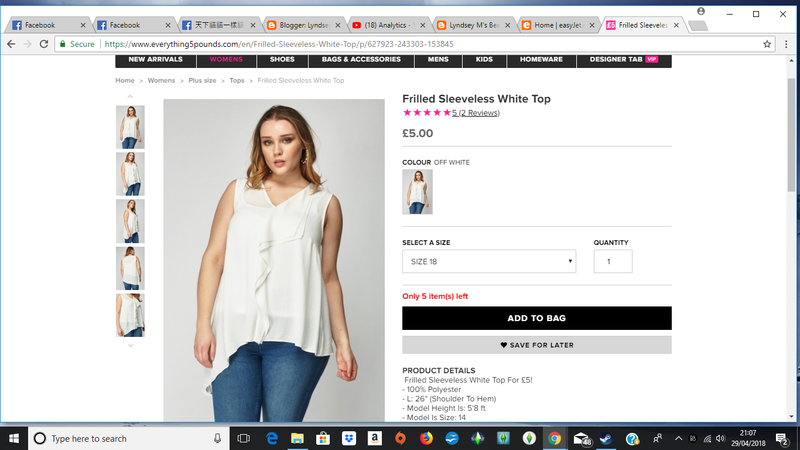 I definitely could not be wearing this top! The top also had flaws in it, there was parts of the top that hadnt been printed on with the design. This dress I chose because it was casual but very pretty pattern. I got a size 18 but once again it was very very big. I was gutted! I looked like I was wearing a moomoo. So considering I had such a bust I am not sure why I went back online again to purchase again, but off I went and ordered another few items. This time it was just before easter when I purchased and it took two weeks for the delivery which considering I paid 8.99 for it I was not a happy bunny! 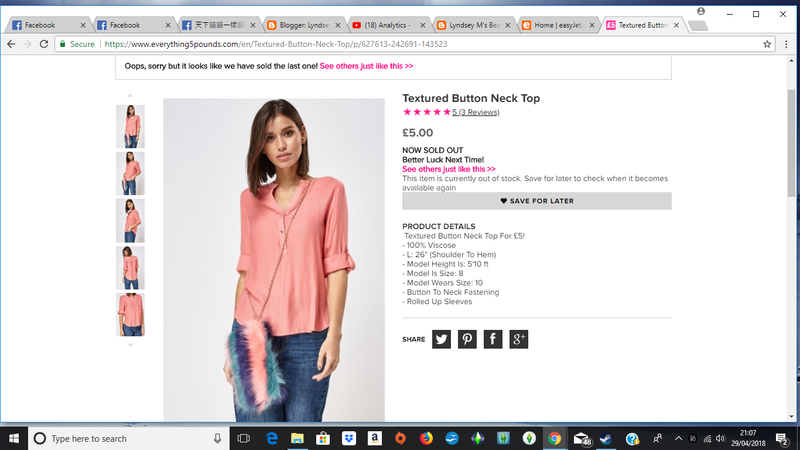 This top was so pretty, it was such a cute baby pink. The top had a woven texture and was great quality. It fitted really well, however, when I moved my arms I felt like the sleeves were just flapping about. I felt like I was wearing armbands. I recognised the pattern of these shoes on the website and had to try them out. 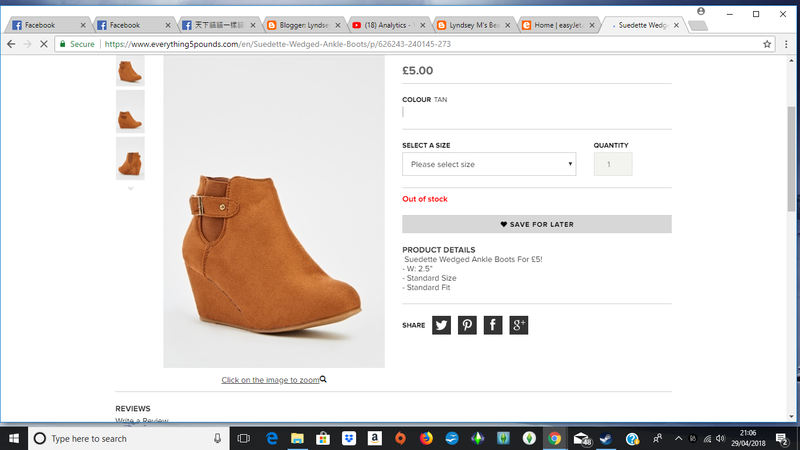 I realised they were from Primark when I saw the name on the inside of the shoe. 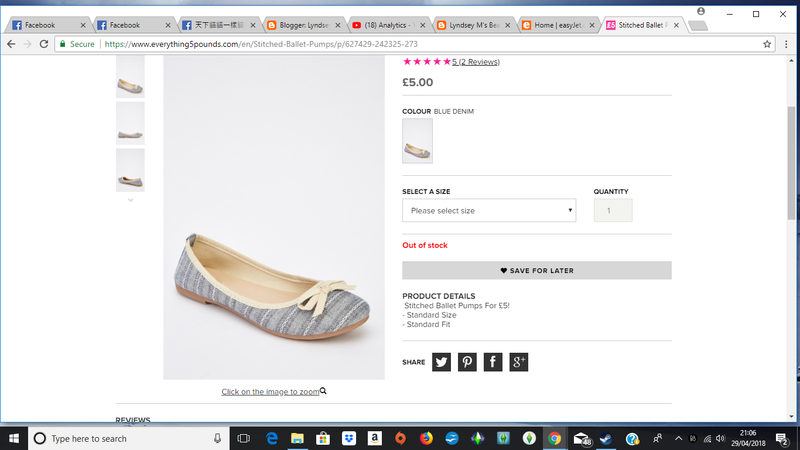 I bought these ones in a size 6 after having issues with the last order, I thought the size 6 would definitely fit better. I was shocked to find they were a tight fit. I will wear them, but I am shocked at how off the fit is. I measured them against my size 5 shoes and they came out smaller. I actually have nothing bad to say about these shoes, they are a decent fit. I didn't find them to be comfortable, but possibly with a cosy insole it will be more comfortable. This dress wasn't a good fit. It was very tight and looked horrendous on me. The quality was good, although had a couple of frayed strands of thread. I was looking forward to this dress but it was just so tight. 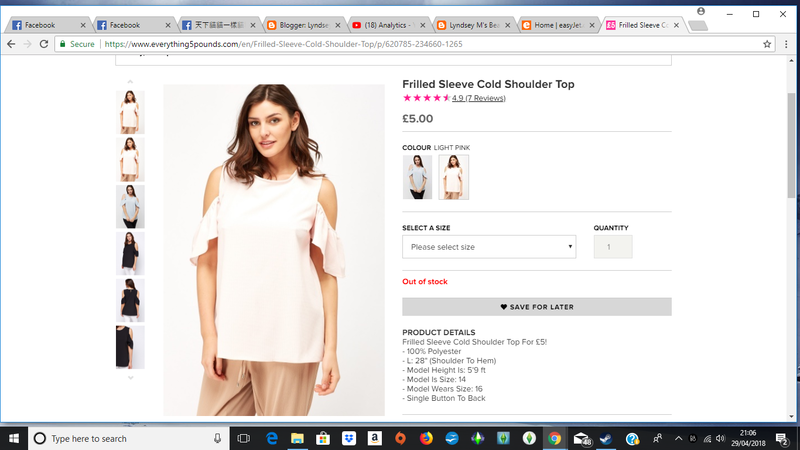 Ok what can I say about this top, it definitely didn't look the same on me as it does on this girl. It was totally see through too so that was a bust. Although looking at this picture the girl was probably wearing a vest underneath. I will try wearing it with a vest and see what I think . 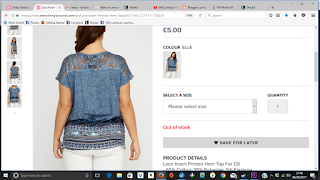 This top I loved, it was casual, well fitting and wasn't see through. I did laugh when I realised it was another Primark top. I am definitely going to get wear out of this top. So once again only really one item in this order that really took my fancy. So in summary out of 10 items I have only been happy with 3 of them. From what I can fathom this website purchases factory seconds and sells them off. The flaws are random, some seem to be flawed by their sizing, some by minor defects in the item. Of course these flaws mean the original brands cannot sell the items full price so this way at least they get some money for them. Do I think this website is good enough to continue shopping on? 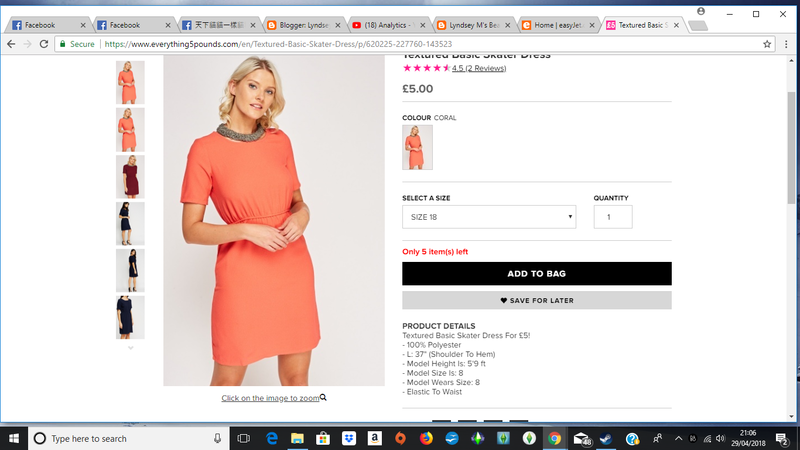 In a word, No, I have spent nearly £100 for realistically only 3 items of clothing because the others I will not be able to wear. 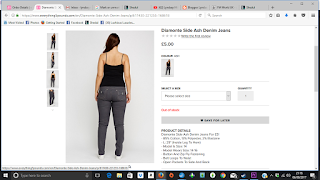 I would not recommend this site as it is so hard to ensure you are choosing the right size of clothes because they are not all made in the same place. 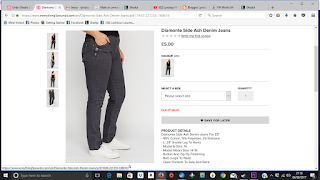 I would recommend saving your money to spend on other websites rather than risking wasting your time and money on clothes that are ill fighting and flawed. So on I go with my search for bargain websites, watch this space. Let me know if you would like me to upload the video of me actually trying on the clothes. So that you can see exactly what I mean about all these items. Thank you so much for watching. Don't forget to hit that subscribe button to be in the loop when I upload. My next post is about skincare for sensitive skin, so watch this space. Love to you all, and don't forget to keep shining. Fibromyalgia isn't a real illness!! I hope this post finds you well. Yes you read this right. I don't believe that Fibromyalgia is a real illness!! Ok ok, put the pitch forks down!! Before you start a lynch mob, I am not saying that people with it aren't sick. Quite the opposite. I just feel that this mystery illness Fibromyalgia has more to it than just one illness! I hope you are all doing well. I made a video a few years ago on this subject, but I don't feel I fully articulated what I was trying to capture very well. I have lived most of my life with pain, exhaustion and constant illness but nothing could have prepared me for what I would come up against 6 years ago. I was working in a nursing home, as a care assistant, studying Health and Social Care with plans to go in to nursing. I wanted to work as a nurse in a home. I loved my job. I loved what I could do to help those I was caring for. I had been taking pain relief for around 10 years by this stage, mostly codeine, every so often increasing to tramadol. Generally that was only for short periods. I had spent 6 weeks off sick from a viral infection. My doctor tried to convince me that this was due to stress in my marriage. He made me believe that it was my body trying to cope with the fact my husband and I were having fertility issues. How is my skin more youthful now than in my youth? I get asked all the time how my skin is so good. I tell them that it is all about a good skincare regime. My skin is better now than it was 10 years ago, but that didn't happen by accident. I have worked hard to get my skin in shape and I love that I have great skin and can come to work as a Beautician and not feel self conscious that I am not perfected.